Riding lawn mowers are the more sophisticated version of the humble lawn mower. Technological advances have made it possible for us to ride around the lawn in comfort as we do our mowing chores. Needless to say you need a fair sized yard to use one of these machines – you would look mighty strange riding around postage stamp sized yard! There has been some confusion over the difference between riding or ride-on mowers and lawn tractors; they are both riding mowers; the difference lies in the positioning of the cutting deck. Riding lawn mowers have the cutting deck located under the machine, at the front and called zero-turn mowers while lawn tractors have the cutting deck mid-mounted. 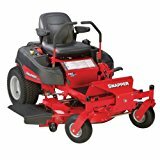 The riding mower has maneuverability though this becomes a problem when there are many obstacles on the lawn like trees, shrubs, miniature rock gardens or flowerbeds. Lawn tractors are the popular choice among home owners; these machines are very versatile as well as inexpensive (for ride-on mowers that is). The advantage lies in the fact that a variety of attachments may be fitted to the machine like snow ploughs, snow blowers, tillers, trimmers, cultivators, etc. You can also attach a wagon, spreader or sprayer adding to the versatility. These machines do not have any speed to speak of – they top out at 4 mph. Zero turn mowers are very efficient machines and speedy as well. They are the more expensive version of the riding mower and are popular with lawn care companies more than homeowners. These machines travel at speeds up to 9 mph and are noted for their fast turns, hence rendering them very handy in mowing around objects and tight spaces. Gas powered mower are a lot easier to find and are a much more powerful and faster mowing option. They are definitely a lot less cheap than the electric lawn mower. Gas mowers are not good for the environment due to the harmful emissions. However, electrical mowers need power and this has to come from somewhere. Riding lawn mowers have front and rear mounted engines for you to choose from. The rear mounted engine comes with rear wheel steering and front mounted cutting deck. The benefit in buying this type of machine is its higher maneuverability around tight corners. These machines are very expensive to buy. - The Zero turn radius features helps to significantly reduces mowing time and is well worth the investment. To clearly understand this amazing feature you need to imagine walking straight ahead and suddenly deciding to turn around, you simply spin or pivot round to make the return journey. That is exactly what the mower does. Close trimming, easy maneuvering around obstacles, extra safety and professional results are some of the associated benefits.